It is one of the best-known ancient monuments still standing in Alexandria today. Pompey's Pillar was originally part of a temple dedicated to Serapis located in the same area, a temple of the God Serapis, now badly damaged. It was built during the reigns of Ptolemy II and Ptolemy III, but was damaged due to the revolts of the Jewish population in Alexandria. It was rebuilt again during the reign of Hadrian (117-137 A.D). It was likely was destroyed, once more, after the appearance of Christianity. It consisted mainly of a high platform accessed by a staircase of 100 steps. Even though most of the Serapeum, or Temple to Serapis is now gone, the site is worth visiting if only to see the grand column known as Pompey's Pillar. At the side of the platform there was a basin, which was used for purification. There were 2 galleries at the back of the temple, cut completely into the rock. In the 1st gallery a black statue of basalt, the 2nd gallery is known mistakenly as the Daughter Library but it seems that it was a burial for the mummies of Anubis. The site of the Alexandria Acropolis also features a “Nilometer.” By means of the Shidia canal, which connected the Nile River to Lake Mariut, the Nilometer was used for measuring the height of the Nile during each flooding season. Book Alexandria Day Tour From Cairo to Explore Qaitbay Citadel, Pompey Pillar, Catacombs and Alexandria Library in Private Day Trip to Alexandria From Cairo. 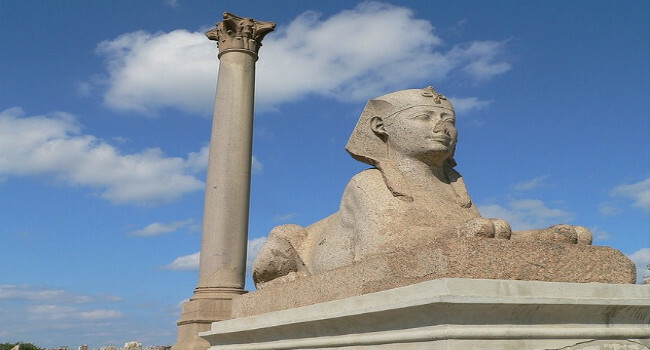 Travel Privately to Cover Egypt Attractions in Alexandria With This Historical Activity. El Ain El Sokhna is one of the newest touristic destinations added to the map in Egypt. It was a simple village with few local resorts. During the previous ten years, El Ain El Sokhna witnessed a huge development with the construction of the new direct route between the city and Cairo. Dakhla Oasis, one of Egypt’s mot remote oases, it is a splendid gateway for a vacation of unlimited relaxation. Dakhla is surrounded by a wall of colorful rock formations and fertile cultivated areas scattered between sand dunes within the area, offering natural magnificent scenery. St. Antony the Great, when orphaned at the age of 18, became a hermit and thus lived to 105 years old. He lived as an Anchorite and it is said that he was tormented his entire life by flatters and temptations of the devil. Taba, in the eastern Sinai Peninsula, marks the location of the southern border crossing between Egypt and Israel. Pharaoh Island is as one of main attraction to explore in Taba. It is an island in the northern Gulf of Aqaba off the shore of Egypt eastern Sinai Peninsula. Approximately 130 Km west of Alexandria on the main coast road to Mersa Matruh. El Alamein has a hot desert climate , in common with most of the Middle East & North Africa. Al Alemein War Museum is one of the best museums in Egypt. A white cream color and massive chalk rock formations that been created as result of occasional sandstorm in the area, intensified by the clear light of noon, shimmering gold at sunset or blackened and shrunken in a cloud filled sky. An oasis of surprises in a stunning desert landscape. Siwa, once the most mysterious of all Egypt's oases lying some 60 feet below sea level between the Qattara Depression and the Egyptian Sand Sea with 23,000 people who speak a distinct language of the Berber family. Most of the desert tours visiting Egypt's Western Desert include a stop at Kharga. It is the capital of the governorate of the new valley, or Al Wadi Al Gadeed. It connected Egypt to Southern Africa through the forty days road. Egypt Western Desert is 262, 000 square miles of dunes, canyons, oases, mountainous plateaus, and valleys that span most of land west of the Nile Valley. The small oasis of Al Farafra is the second biggest depression by size in Egypt West Desert and the smallest by population. The most accessible of the Western Desert Oases, Bahariya offers many interesting attractions and a foretaste of how life goes in an oasis. Bahariya Oasis has a particular historical significance as it was a transit point for the Caravan tracks and Nile Valley. About 30m wide and 8m high, and contains animal engravings dating back from the Neolithic Period. Djara cave is located at the middle of Egypt Western Desert on a limestone plateau next to an old camel track connecting Farafra and Assiut. Most people are not aware of the beauty of specific parts of Egypt desert. The section that attracts tourists the most in Sahara Western Desert is that particular area located between Bahariya Oasis in the South and Farafra Oasis in the North.